There is a reason that the clowns are the finest athletes in the circus: you have to be very, very good at something to do it “badly” and not get seriously hurt. By the same token, anyone creating a satirical version of an art form must be excellent at that art form in order for the humor to work. Otherwise, it just looks awkward and amateurish rather than snarky and funny. 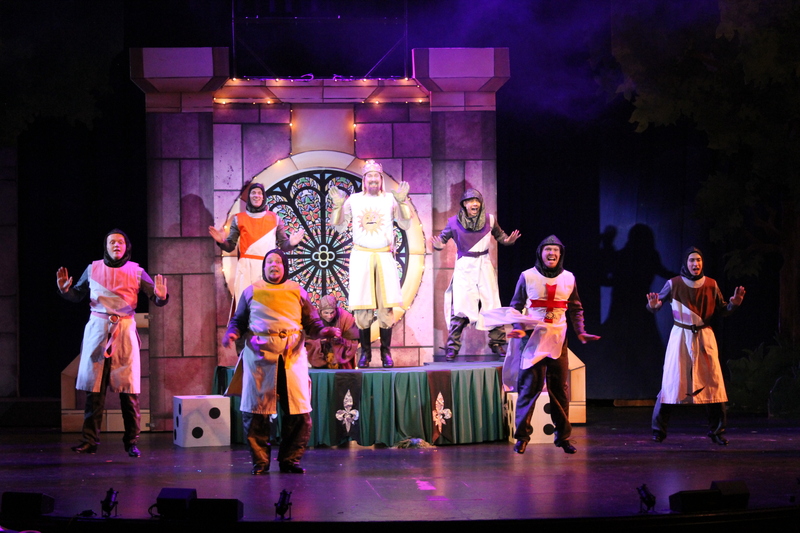 Which is why it is delightful to be able to say that the new production of “Monty Python’s Spamalot” at the Candlelight Pavilion in Claremont has the absolutely necessary combination of crisp production, talented performers and unified wit needed to pull this thing off. One bad performance, or unintentional awkward transition, and much of what makes this show so very funny would be lost. “Spamalot” is, of course, Python member Eric Idle’s reworking of the absolutely classic satiric film, “Monty Python and the Holy Grail,” which made fun of every possible aspect of the genre of medieval romantic stories and movies. Set to music by Idle and John Du Prez, it sets tongue firmly in cheek, and gets sillier and sillier as the evening progresses. That is, it does if the show lives up to its potential. Here it does. The tale starts out as a silly version of King Arthur and the search for the Holy Grail. It takes any number of side trips, reworks Arthurian characters with abandon, and makes almost no sense, but then it isn’t intended to. In a comparatively small cast called upon, in most cases, to play a number of parts throughout the evening, there are several standout performances. Chelsea Emma Franko sings beautifully and carries the integral part of The Lady of the Lake with style and wit. Just such a performance is necessary to keep this thing moving. Raymond Ingram makes a solid King Arthur, and Adam Trent has a ball as his servant (complete with traditional coconuts). Emerson Boatwright is the perfect, geeky historian, and a delightful Prince Herbert. 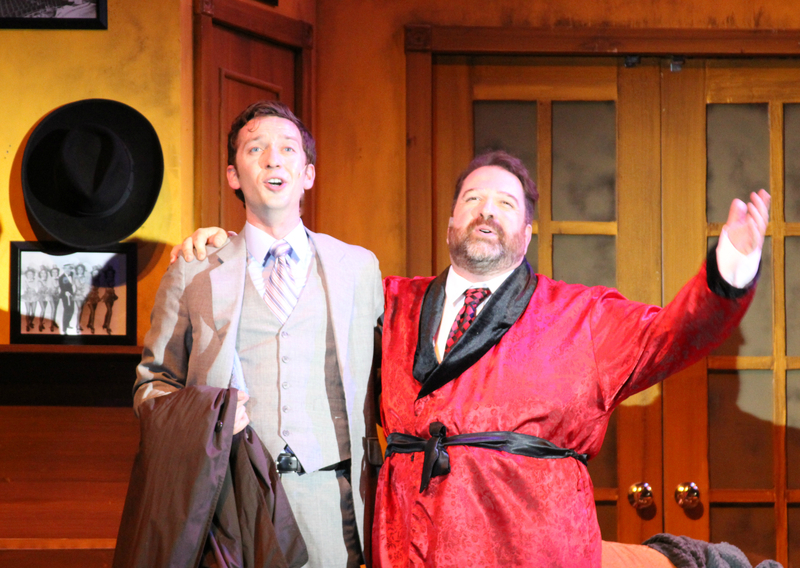 Matt Dallal gives Sir Robin the properly milquetoast attitude. Jotape Lockwood’s dim Sir Lancelot, Bryan Vickery’s solid Sir Galahad, and Robert Hoyt in several parts but particularly Galahad’s mother all work well together. Indeed, the ensemble quality of this makes it all work, as the rest of the ensemble who back up these major players helps to prove. The only major thing which could use fixing is the occasional bit of diction, especially when, as Lockwood must at one point, one must speak in an accent. The lines in this show are its best feature, so understanding what you hear is a must. Director Chuck Ketter has just the right touch regarding both the pacing and the ridiculousness. 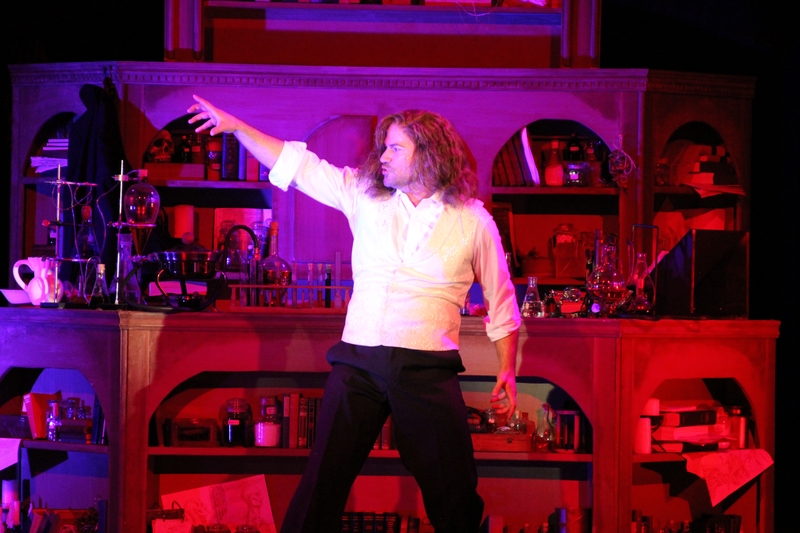 Janet Renslow’s recreation of Casey Nicholaw’s original choreography, adapted for the smaller Candlelight stage, keeps the whole thing lively and showcases the multiple talents of the cast. As was true of the original film, there are somewhat scatological jokes of one kind and another. One might want to rethink bringing small children, or the kind of adults who would be disquieted by Monty Python’s sometimes colorful humor. Still, I admit to taking my own kids, when younger, to see the film. My son even had a shirt with the French taunts on it which he was sad to grow out of. 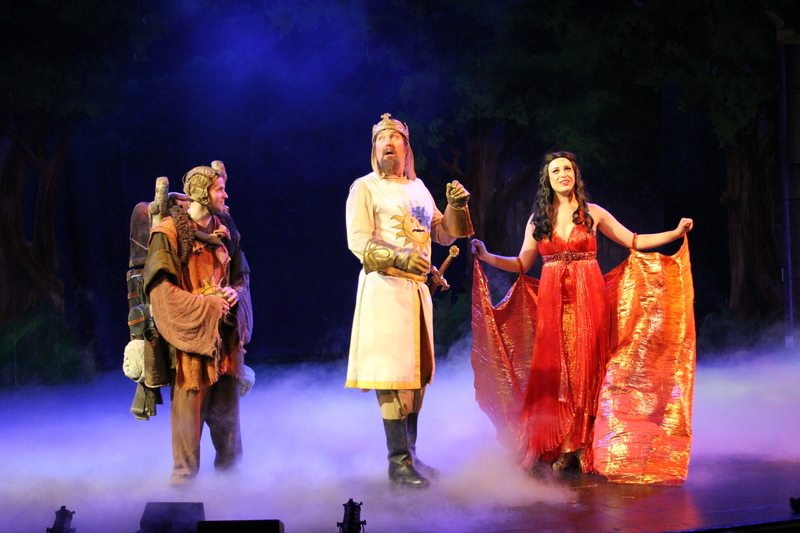 Candlelight’s “Spamalot” is just plain fun. That it comes with a pretty nice dinner is just an added plus. Go and have fun. That’s what this show is all about, after all. An interesting trend in American musical theater in the past few decades has been the creation of stage versions of classic movie musicals, rather than the other way around. Though making movies of Broadway shows had its own set of issues: expanding beyond a stage’s confines, reduction of the suspension of disbelief, or even the need to rework the thing to feel cohesive without an intermission, shrinking a movie has more. This is especially true of a film best known for its choreography. Which is why any stage production of “Seven Brides for Seven Brothers,” such as the one at Claremont’s Candlelight Pavilion Dinner Theater, comes with an automatic challenge. The film, which generally has rather two-dimensional characters, has remained a favorite because of its dance sequences. Yet, those wildly energetic sequences could be filmed in sections – they didn’t have to be danced straight through. On stage, they must be. And, on stage, the balance between song and story and character and dance must be more even. At Candlelight, they do manage to fit the tale to the size of their stage – a task all by itself. And, by and large, the dancing is good enough to keep the flow going. Some of the performers prove adept at giving significant humanity to the otherwise rather simplistic material. Still, it could use a few improvements. The story is silly, but amusing. Adam Pontipee, a lumberman living with his six brothers in the wilds of the Northwest, comes to town for an infrequent visit to buy not only household supplies but a wife. When he meets Milly, a girl with no family, she agrees to marry him. The surpise for her at the end of her long journey is the number and condition of his younger siblings. Pretty soon she has the other Pontipee men anxious for brides of their own which, when they visit town, they capture and bring back to the hills just as winter hits. Much of this is told in song and dance – particularly the hoedown dance-off prior to the girls’ abduction for which this show is so particularly well known. Director/Choreographer Janet Renslow has a feel for the style which must be translated from the film. Her performers have a robust quality overall – a western hardiness. It must be admitted that some of her dancing ensemble struggle on occasion with the intense demands of these very physical sequences, but their enthusiasm continues to shine. And, for the most part, the central characters add to that with an earnest sincerity which keeps the show moving, and connected with the audience. Stacy Huntington makes a charming Milly – tough but still romantic, practical and loving. All six of the brothers (Josh Taylor, Tyler Logan, Michael Milligan, Donald Pettit, Chaz Feuerstine and Ariel Neydavoud) have a kind of gangling charm, most particularly Neydavoud as the youngest, Gideon. The girls they scoop up (Sharon Jewell, Jessie Parmelee, Susanna Vaughan, Sierra Taylor, Rachel Burkert and Andrea Aron) also have that innate innocence which makes the show work, and dance very well – their major requirement. Indeed, only Sam Zeller, as Adam, proves shaky. Part of this is not his fault, as he was cast into a part outside his vocal range at a theater with a prerecorded orchestral part allowing for no transposition. Some songs which should be belted out can barely be sung at all. They’re just too low. And, perhaps frustrated by this, he seems to perform in a kind of isolation. With the other characters connecting as well as they do, this begins to stand out and make his character seem more “acted” than the rest. Still, for charm and warm-hearted enthusiasm, this “Seven Brides for Seven Brothers” works a lot more than it doesn’t. The memorable songs and nostalgia factor work well, and when combined with a good meal, this all makes for a lighthearted evening. Stay tuned for their annual original Christmas show, coming up next. The musical “Sweet Charity” falls into the unusual category of Broadway shows which have music far more famous than their productions. Co-opted for everything from advertisements to concerts and variety shows, songs like “Hey, Big Spender” and “If They Could See Me Now” have had enormous staying power, even as the plot they came from gets lost. Perhaps this is because the show was crafted by director/choreographer Bob Fosse as a showcase for his extraordinarily talented wife, and muse, Gwen Verdon. Perhaps it comes from the fact the tale is adapted from a rather bleak Fellini film. In any case, the tale of plucky taxi dancer Charity Hope Valentine, whose optimism powers her through one romantic disaster after another, deserves another airing. Now it gets one, at the Candlelight Pavilion Dinner Theater in Claremont. 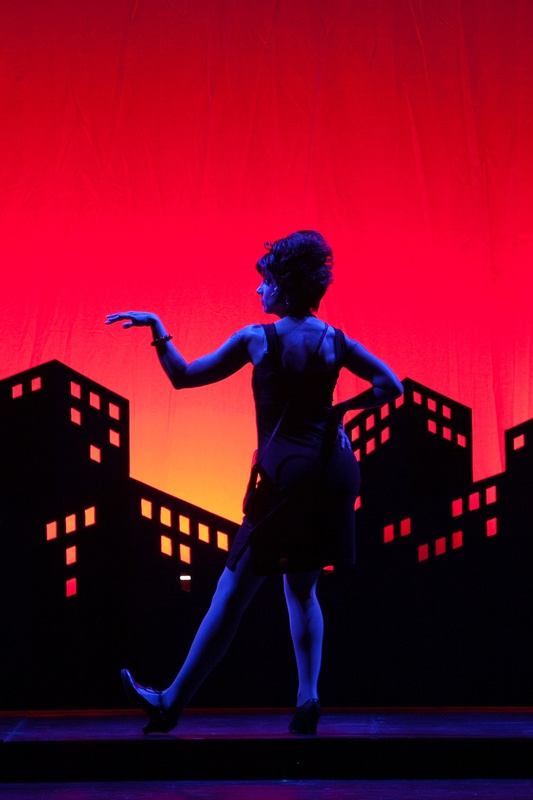 To make “Sweet Charity” work, you have to honor the original. Large portions of the show are devoted to dance, and Fosse-esque dance at that. This means your dancers must be quality, something Candlelight pulls off. Choreographer Janet Renslow has a genuine feel for what the numbers have to look like, and those signature – and necessary – moves translate well onto this solid cast. Tracy Pedretti makes a terrific Charity. She has just the right balance of naivete and bravado, and dances up a storm. As her two far more cynical buddies, Tiffany Reid and Eli Menendez create tough, but humorous contrast to Charity’s constant upbeat view. Along the way, they handle my personal favorite moment of the show “There’s Gotta Be Something Better than This” with great intensity. As Oscar, the most likely, and yet also most likely to be scared off, of Charity’s love interests, Bobby Collins finds the charm in the character’s nerdiness. Other standouts include Kayla Ann Bullock, delightfully stereotypical as a famous movie star’s woman, Michael Worldly as a jazz-hippy-new age preacher, and John LaLonde as the movie star. Deborah Fauerbach provides some stunning moments as a featured dancer, as well. Neil Dale’s tight direction keeps the story from becoming depressing, and integrates beautifully with the long dance sequences. Set designer Kerry Jones even manages to get a ferris wheel into the small Candlelight space. In short, though this musical is not for the kiddies, it has a sort of “pull up your socks and move on” charm which, when combined with solid dancing and singing, propel it to a wry charm. You like Charity, and are kept from wallowing in the darker underpinnings of her life by her sunny nature. This is what this show has to offer: that sense that attitude can keep a disaster in perspective, even in an outwardly unfriendly world. We could all use a lesson or two in that area.